Yoco co-founder Carl Wazen (second from right) says the integration with Xero extends Yoco's mission to empower the growth of SMEs. 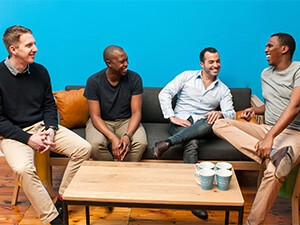 Cape Town-based payments company Yoco has integrated with Xero, New Zealand-based cloud accounting software for SMEs. Yoco's point-of-sale (POS) app and card readers enable SMEs in SA to accept card payments at the store or on the go with no monthly fees. For Yoco merchants that use Xero as their accounting software, this integration means their cash and card sales, VAT, bank account settlements and processing fees will be seamlessly updated into their Xero account. The companies say this is a major step towards automated booking and makes it easier for merchants to do business. "Our integration with Xero is an extension of Yoco's mission to empower the growth of small businesses by allowing our merchants to spend less time administering their business and more time growing and engaging their customers. We want to make running a business as easy as swiping a card," according to Carl Wazen, Yoco co-founder and chief business officer. The integration is being beta tested with a handful of small businesses and will be live on the Xero Add-ons marketplace next month. This marks Yoco's second integration with a global tech company and will be the first POS payments add-on for Xero on the African continent. "We welcome when other tech companies, like Yoco, integrate with our platform and enhance the user experience," comments Gary Turner, Xero co-founder and MD for Europe, Middle East and Africa. "Nowadays, accounting platforms are no longer an in-house facility running on a mainframe somewhere. Xero represents a new breed of business support technology based in the cloud, specifically suited for SMEs," adds Nick Jacobs, senior software engineer at Yoco. "This fits in perfectly with Yoco's fully cloud-based architecture, making this integration possible by leveraging open standards like OAuth and HTTP-based Web services. Xero's existing Web services interface made integration of the Yoco back-end a straightforward development exercise," he says. Yoco launched in October 2015 and is headquartered in Cape Town but operates nationwide. It has 1 500 merchants using the system, is growing by over 200 merchants per month and employs 25 people.